Native to southwestern U.S., Mexico. Fast growth rate when young, then slowing. Leaves 6" to 9" long, twice pinnately compound, leaflets in 1 to 3 pairs, crowded, both the rachis and the petiole practically obsolete; secondary leaflets numerous. Branches gracefully spread to form a rounded head. 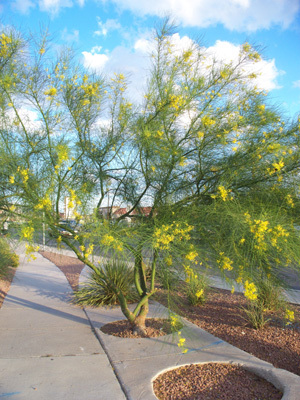 Palo Verde is an appropriate tree for hot dry sites and poor soil. It's frequent showy blooms and green bark make it a worthy specimen tree. Hardy to 13 degrees F.